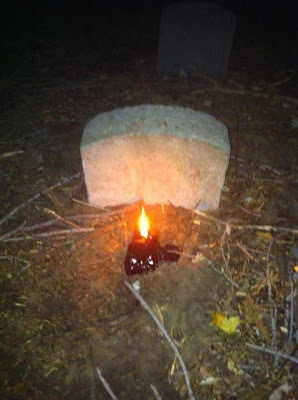 I received a few photos with very little details... all I know is that they were all taken in the same cemetery during a full moon. Since they were sent to me - I presume them to be from a local cemetery as well, but I'm not sure. In any event - the subject matter is the objects left at the tombstone. 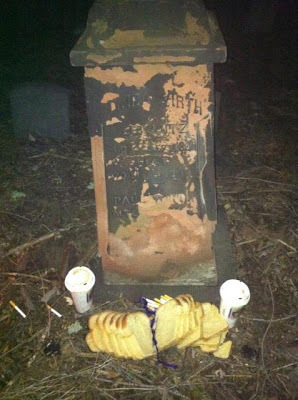 I know there are many odd and not-so-odd traditions regarding offerings in cemeteries, but does anyone have any idea what these mean? A candle. Simple enough, but what's it made of? Blue hair braid over a loaf of bread, two cups of coffee and what appears to be an entire pack of cigarettes. 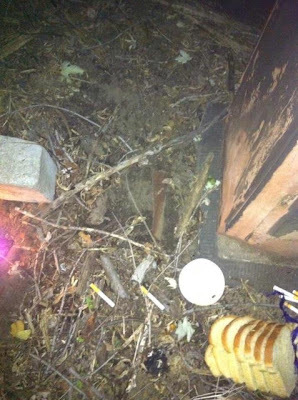 ...there's also a suspicious hole next to the tombstone. So what do ya think? Someone remembering a buddy with whom sandwiches, coffee and smokes were shared, or something more subtle? What kind of graveyard magic is this?